For a number of years, ethnic style has been one of fashion’s key trends. As part of this trend, U.S. designers are deriving inspiration from native culture, incorporating feathers, leather and traditional geometric decorative patterns into their collections. 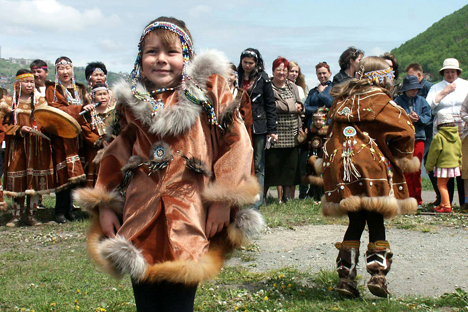 RBTH takes a look at the traditional clothes and decorations worn by one of Russia’s native peoples, the Aleuts. The Aleuts are an indigenous people that live on the coast of the Pacific Ocean, in the Kamchatka Region — more specifically, on the Commander Islands (Bering and Medny islands) just east of the Kamchatka peninsula in the Bering Sea. According to a census, the Aleut population numbered just 540 in 2002. After the Aleutian Islands were discovered by the Great Northern (Second Kamchatka) Expedition (1733–1743), they, along with part of Alaska, were transferred to the oversight of the Russian-American Company. The particularities of the climate gave rise to a distinctive culture of clothing. The most popular item in the Aleuts’ traditional wardrobe is the parka: a long, double-lined, poncho-like fur shirt that is made from seal or sea otter fur, or from birdskin. In effect, the modern parka is the descendant of the shirts worn by Aleutians and other Arctic peoples, only it is made from lighter fabrics and has a front zipper. In case of inclement weather, fur parkas were worn with the fur on the inside. Birdskin shirts, with the feathers on the outside, provided excellent protection from rain as they repel moisture. When necessary, a kamleika was worn on top of the parka. A kamleika is a waterproof garment that is made from the intestines of marine animals and has long sleeves and a drawstring hood that covers the neck. The kamleika may have served as a prototype for the modern windbreaker. Both parkas and kamleikas were frequently decorated with embroidery and fringe. The men’s and women’s models had the same fit and similar decoration. Women’s formal parkas, which were made from foxskin, were particularly beautiful. Another traditional garment was brodni — trousers made out of skin from the throats of sea lions — with torbasa, waterproof soft boots made from the hide of sea animals. The Aleuts also invented a cap. Their field headwear was a large wooden visor (for the ordinary hunter) or a wooden hat with a visor (for chiefs), which protected the hunter’s eyes from sunlight on the water and ocean spray. Only men wore such headgear, as a means of displaying their social status. Women wore festive hats made out of hide and birdskin with a variety of decorations, or hides decorated with band patterns. The Aleuts were great fashionistas and they knew that accessories create a look. Essential components of the festive outfit were bracelets, necklaces and even pendants for piercings that were made out of stone, bone, wood, sea lion whisker, roots and feathers. Today civilization has done its work, and in its daily life the population of the village of Nikolskoye, where the majority of Russian Aleuts live, prefer light, comfortable Western clothes and other fruits of modern culture. Nonetheless, the Aleuts are careful to preserve their traditions. The village often holds folk festivals and traditional events, and has two local folk dancing collectives called Unangan and Chiyan. At such events, of course, all the traditional Aleut clothes are proudly paraded: The participants wear parkas, fur, feathers, painted wooden headgear and colored threads in their hair.